“My friend grew up in the Falkland Islands and she met this little penguin that followed her around and would not go back to sea,” she said. So Shirley decided to both write and illustrate a trilogy of children’s books based on the unusual friendship. 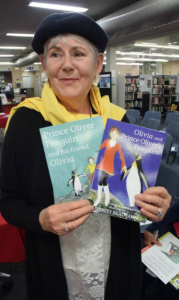 The first two books, Prince Oliver Penguin and his Friend Olivia and Olivia and Prince Oliver’s Penguins, were launched in front of an excited crowd of children at Nowra Library on October 5. “What’s great about these books is that they are both text and picture, they’re for children transitioning to text-only books,” she said.